Not only is the veteran journalist’s book a first for Iwata, it’s also a first for me since it’s an e-book, my first using Amazon’s Kindle app on my iPad. I’m really enjoying the book and the experience reading it. E-book, for those still unfamiliar with the term, stands for electronic book, a format that’s been around for many years now. Only recently, though, have e-books become hugely popular with those who like to read books. That growth is thanks to improved software and the growth of e-readers, tablet computers like the aforementioned Amazon Kindle (they also have the Amazon Fire tablet, which has greater functionality beyond just publications), the Barnes & Noble Nook, and the 800-pound gorilla of the field, Apple’s iPad. These devices let the user purchase, instantly download and, most importantly, read a computer file pretty much as you would a physical, traditional book or magazine on the printed page. Despite the rise of e-books, I don’t see the demise of traditional books yet; they still have advantages e-books do not, since no batteries or devices are required to read them. But e-books, like nearly everything digital, have an advantage over books in that they don’t take up physical space (you can have literally dozens of books and magazines stored inside your tablet computer), they’re generally less expensive that traditional books, they are available instantaneously (no visit to a brick-and-mortar store or waiting for delivery to your home), and do little things like allow you to get the definition of an unfamiliar word as you read. Iwata has spent nearly 30 years as a journalist, most recently on the business beat. He’s worked for such big-time newspapers as USA Today, San Francisco Examiner, San Francisco Chronicle, Orange County Register and Los Angeles Times. 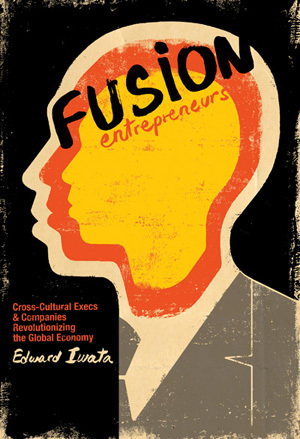 Fusion Entrepreneurs cover by Edel Rodriguez, a Cuban American artist who does covers for the big New York magazines. On his personal side, Iwata was born and raised in part in L.A.’s Crenshaw district, but now that he’s lived in Northern California for so many years covering the Silicon Valley, he says that when he visits L.A., he gets lost driving here. His grandparents “raised a flock of kids, grew fruits and vegetables on leased land, ran a store near Little Tokyo,” he notes on one of his blog posts. Iwata noted that the late Sue Kunitomi Embrey was his aunt. Regarding his blog — CooGlobalBiz.com — it’s worth visiting. As can be gleaned from its name, Iwata’s blog is his personal take on business trends and developments, whether it’s globalization, cross-cultural pollination, the impact of the Internet, workplace diversity, sports, digital communication and more. Iwata said that “Fusion Entrepreneurs” was three years in the making, although he admitted that had he worked full-time on the book, it would have been half that. To me, Iwata’s book is the culmination and distillation of his decades in business journalism’s trenches thus far and his observations from the perspective of a Japanese American. He liked taking the e-book route for “Fusion Entrepreneurs.” On the downside: He says “you’re a one-man show” with regard to publicity, marketing and so on. But as someone who loves his independence, he says it’s the way to go. Also, his personal cut for sales is higher than if he had gone the traditional publishing route. Speaking of sales, as an e-book, Iwata’s “Fusion Entrepreneurs” is a bargain at $5.99 — worth the price of a Subway sandwich, he joked. Unfortunately for anyone interested in reading the dead-tree edition, there isn’t one, at least not for now. Correction Dept. : I don’t like having to correct fellow Rafu Shimpo columnists; in some cases that would prove to be a full-time job. But in the Tuesday, Sept. 25 Rafu Shimpo, George Yoshinaga noted how JACL now has a Chinese American president. While that is accurate (even though he evidently sees that as a negative), he wrote that the staff of Pacific Citizen includes Roberta Brown and Hugh Burleson. That is incorrect. I know this because for the past few weeks, I’ve helped the P.C. put out three issues because of staff shortages. If either of the aforementioned folk were on staff, they sure as heck weren’t on hand to help get any issues out! As for Harry Honda, who was also mentioned in the same part of that column, he will be feted by the JACL’s PSWDC as a “living legend” on Saturday, Oct. 6. Maybe if Yoshinaga can summon the horsepower to be there, he can see his buddy Harry get his recognition. I’ll be sure to bring a lighter if I see anyone shuffling around with an unlit stogie in his piehole. George Toshio Johnston has written this column since 1992 and can be reached at [email protected] The opinions expressed in this column are solely those of the author and do not necessarily reflect policies of this newspaper or any organization or business. 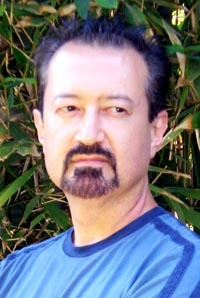 Copyright © 2012 by George T. Johnston. All rights reserved.